ANTANANARIVO — Known as one of the world’s poorest countries, Madagascar has much room for improvement when it comes to their economy, education and infrastructure sectors. With the unfortunate prolonged political crisis that began in 2009, the country has faced negative economic and social impacts that have increased poverty levels. There are five development projects in Madagascar, among hundreds of others, that will set the precedence for a successful future for the country. Approved in September of 2015, the Social Safety Net Project is aimed to be in production until September of 2020. This project’s objective is to allow more access to safety net services for extremely poor households. In addition, this project would begin building a social protection system, which will help in reducing poverty by helping people manage their economic and social risks like unemployment, sickness or disability. Currently, 80 percent of the Malagasy live on less than $1.25 a day. This large portion of the population has been unable to fulfill their basic needs to live. With the Social Safety Net Project, there will be opportunity for residents to use cash-for-work processes and a cash transfer program for mothers of extreme poor families to support their families. The cash for work activities give individuals the opportunity for temporary employment up to 45 days per year. The cash transfer program will be conditional based upon children’s school attendance and participation in the community nutrition program. The Irrigation and Watershed Management Project will help in four of Madagascar’s agriculture sectors: agriculture extension, research and other support activities, irrigation and drainage, fishing and forestry and agricultural markets, commercialization and agri-business. With a $15.05 million budget and a deadline of February 2018, this project is aimed at rural development and should see some rewarding benefits. As rice is the main crop grown in Madagascar, irrigation systems are important to upkeep. In 1996, production of the rice paddy had become stagnant, and that status would last for the next ten years. Agriculture had weakened because of poor infrastructure, too traditional farming systems and limited access to agricultural technology and services. The Irrigation and Watershed Management Project would change this by helping to create more access to agriculture needs so farmers could grow quality crops in a timely matter. One-third of the population of Madagascar does not have access to basic needs, such as education. The literacy rate in Madagascar is currently at 64.7 percent with only an 11 year median school life expectancy from primary to tertiary education. The low levels of educational importance impede the development of future generations within the country. The Emergency Support to Education for all Project began in October 2013 and is expected to conclude at the end of December 2017. There are three objectives of this project that are going to help in preserving access to primary education and improving the overall learning environment for various areas in Madagascar. The first objective is to reduce the cost of schooling to improve general access to primary education. The second objective is to strengthen the teaching and learning environment for all students and teachers. Lastly, the third objective is to rebuild stakeholder’s capacity and encourage more community participation to progress the education system. 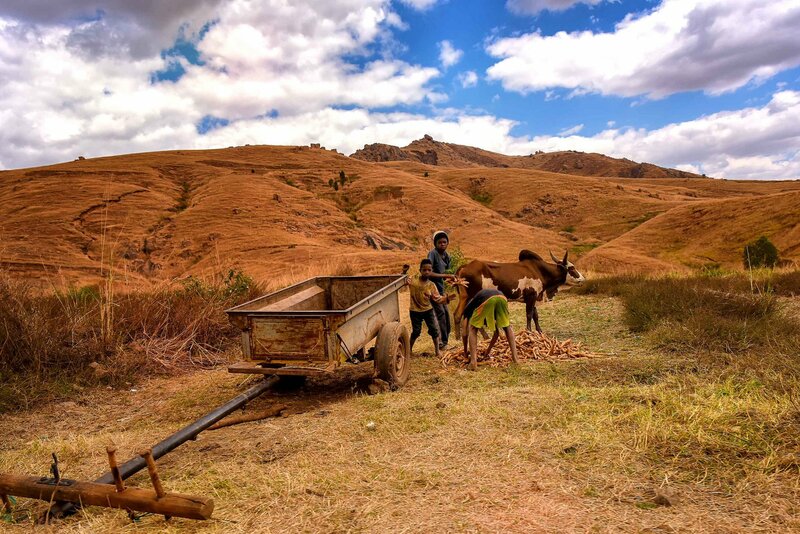 One of the most critical development projects in Madagascar aims to improve responsiveness to food security and locust crisis by increasing agricultural production and giving more access to cash transfers and cash for work activities for extremely poor families. The components would help in restoring and maintaining agricultural productive capacity, providing a social safety net for the poor and access to the contingency emergency fund which is used for disaster recovery, and project management. Nearly one million Malagasy are affected by extreme hunger. By the set end of the project in February 2018, there are hopes that more families ridden by extreme poverty will be more protected from food insecurity. Agriculture infrastructure will be improved, which will increase agricultural production and give families more basic needs. The last of the five development projects in Madagascar — one of the most expensive projects thus far — is the Emergency Infrastructure Preservation and Vulnerability Reduction Project. This project is split into four sectors: roads and highways, other social services irrigation and drainage and general water, sanitation and flood protection. The economic and social change that came along with the governmental change of 2009 caused a large reduction of public investments in all previously stated sectors. As a result, all sectors were unable to hold up to natural disasters that hit the country and development came to a screeching halt. This project is aimed towards populations most vulnerable to greater human suffering. These populations will receive better education and health and nutrition service. As far as weather prevention services go, there will be an all-weather access on national roads through spot rehabilitation. Improved agricultural infrastructure will give families better food security. Lastly, development of better resilience of disaster risk management activities will give residents greater preparation for natural disasters. Each of the five development projects in Madagascar are individual efforts that intertwine to create a better country for its people. With most projects ending within the next couple of years, it is expected that poverty rates will decrease as a result and help the people of Madagascar out of extreme poverty.